Do you remember about a week ago I had mentioned that I was frantically trying to get some quilts off to the quilter? I thought I would share one with you that just came back and I finished binding. 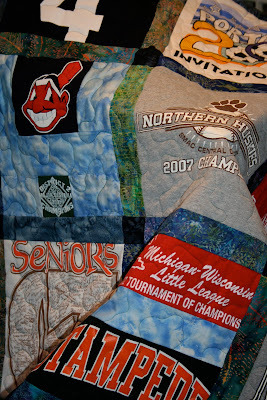 This t-shirt quilt was a special order. About this time of year the orders start coming in for graduation gifts. Last year I made 8 of these in about a three month span. This one is for a boy and I was quite pleased with the way it turned out. I have to set my shabby chic self aside when I use the batik fabric. You really feel like you get to know a person when you make one of these quilts. I feel like I've taken a walk through their life. 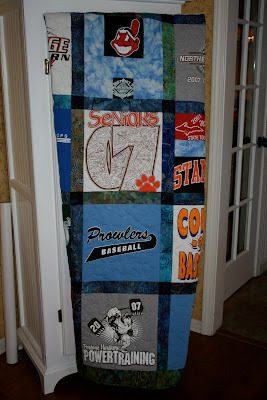 I made one for my son for his high school graduation last year that he took to college with him. I used almost 35 shirts for his, the usual being twenty. A lot of creative piecing, but it was worth it. We hung it up at his graduation party and all the guests took their own walk through his life. I really love quilting. I'm so glad that God gave me something to do with my hands. Have a blessed day using your hands for creating in whatever way He directs. Beautiful quilt! I would love to make one like that. Will you please tell me how you quilted the tshirt material? I have a box full of my dads tshirts that I promised my step mom, I would make into a quilt. He passed away a couple of years ago, this would mean so much to her! I love this quilt. I've never seen one like it. I have never quilted before. I'm afraid it would take over my other hobbies....not enough time! !